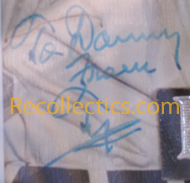 1947 Ty Cobb Autographed Wire Photo from the personal collection of Danny Goodman, long-time baseball executive in Southern California. Flanking the moribund Babe Ruth are Ty Cobb and Tris Speaker. In particular, Cobb signed his image in his inveterate green fountain pen "To Danny from Ty". The photograph, a 9" x 7", has been mildly edited for publication, and it was probably Goodman who later affixed a cardboard identity plate citing "Babe Ruth." The photograph is in excellent condition with trace remains of the original media caption on the reverse. Not to be overlooked here is the memory of Co b and Speaker who, in 1926, were compelled to defend themselves against allegations of conspiracy (stemming from a regular season Tigers-Indians game in 1919) as investigated by the humorless Judge Landis. 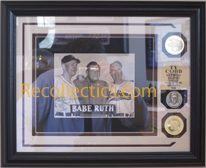 Included in this frames piece are three coins two representing the Detroit Tigers, and one .999 Pure Silver coin representing Ty Cobb. Comes with a PSA/DNA Authentication Letter.